I said that Deutsche Bank would have to raise more capital (see my October 27 post). Their CEO said they didn’t. Well, they did. They have announced an equity raise of nearly $10 billion. This is good news and bad news. The good news is that they were able to get buyers for their shares despite the slow grind down in bank profitability. The bad news is why. DB does not have a liquidity problem because deposits are not falling as they are throughout the EU banking system. And that’s the problem. European depositors are seeking the security of Germany. Money continues to flee Italian, Spanish and Portuguese banks just as it fled Greece in 2012. The evidence is in the ECB’s Target2 data. Target2 stands for Trans-European Automated Real-time Gross Settlement System. It is reflects capital flight from the “Club-Med” countries in Southern Europe (Greece, Spain, and Italy) to banks in Northern Europe. Here’s how it works for trade. Spain imports and sells a German car, but Germans buy no Spanish goods in return. No offsetting German capital goes to Spain either. Therefore, the German central bank gets an IOU issued by a Spanish commercial bank that funded the car purchase. This IOU is guaranteed by the Bank of Spain. In short, Spain bleeds capital. The same thing happens if a Spanish saver moves savings from a Spanish bank to a German one. The Spanish central bank is on the hook to the Bundesbank for that transfer. 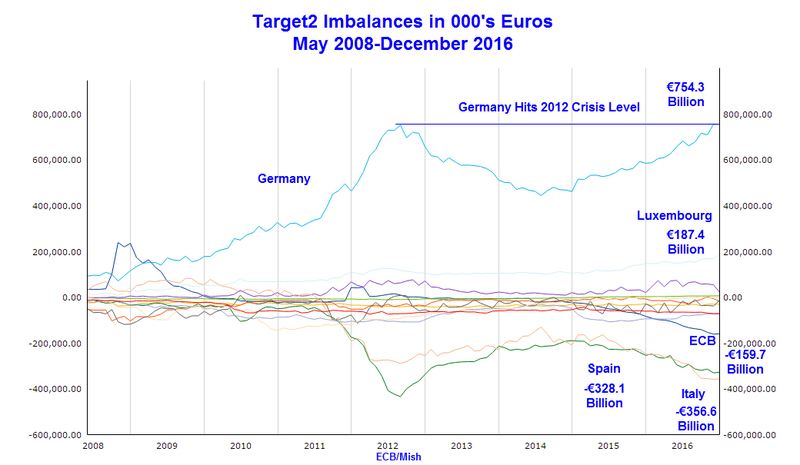 Eurozone Target2 imbalances have now exceeded the crisis levels hit in 2012 when Greece was on the verge of leaving the Eurozone. That resulted in capital controls on Greece. Italy could be next. Here is the data. The above data is as of December 2016. A check of the Bundesbank Target2 Balance as of January 31, 2017 shows a new record high imbalance of €797 billion. 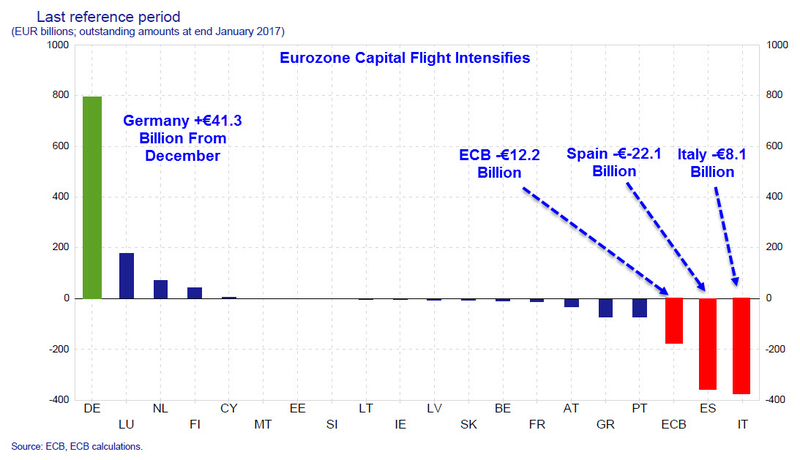 The January data below shows capital flight from Italy and Spain to Germany has intensified again. These outflows to Germany are creating two problems. First, the banking systems of Italy and Spain are already dangerously illiquid and cannot stand to lose more deposits (see my December 27 post). Second, the Germans see that they are owed an enormous and growing amount of money by the central banks of countries that are increasingly questioning remaining in the Eurozone. Could Italy ever pay the E364.7 billion it owes the Bunderbank? My personal view is that the Eurozone will not survive in its present form for more than one more year. The Italian banking system will likely collapse first. Next Next post: U.S. Treasury Headed for Disaster?